Welcome to Redland Treatment Rooms. Here you can relax, unwind and indulge yourself in our luxurious treatments. Our aim is to ensure that on each visit your mind is rested, your body energised and your mind is restored. You can subscribe to our NEWSLETTER here for exclusive special offers and discounts. Treatments we can provide include: Non-surgical Facelifts, Microzone Dermalogica, Medicated Cleansing Treatments, Age Smart Facials, and Eye Treatments. Whether you are concerned about your skin ageing, sensitivity, or if you have acne prone skin, try one of our customised facials and discover the difference that Dermalogica can make for you. 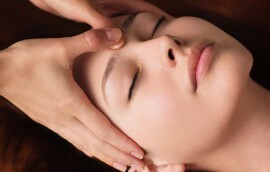 Our unique facial treatments achieve effective and immediate results for all skin types and conditions. At Redland Treatment Rooms, you can choose from one of our many indulgent and relaxing full or part body treatments. Too often body treatments are considered a luxury, or solely for pampering and are not treated as another practice of skin health using only proven and trusted Dermalogica ingredients. Your neck, and décolleté are often ignored along with your hands and these areas are usually the first places to display premature ageing – we can improve their appearance with our luxurious treatments ideal for sunburned or irritated skin. Choose between Jessica maintenance treatments or the luxurious Jessica GEleration and CND Shellac ranges for a more pampering experience. Award Winner! We’re delighted to announce Dermalogica has won two awards in the Social & Personal Best Beauty Buys 2013! I had my eyebrows tinted and waxed by Louise. She was very professional, answered all my questions and made me feel really comfortable during the wax. I booked in to have a spray tan in preparation for a wedding – Louise is lovely and made me feel completely at ease. We managed to fit the whole body spray tan into my lunch break from work which was just fantastic and didn’t feel rushed at all! The finished colour was beautiful and I will be booking more treatments at Redland Treatment Rooms. I would highly recommend them. As a courtesy to our therapists here at Redland Treatment Rooms and our other clients we do require at least 24 hours notice should you require to cancel or rearrange an appointment. Missed appointments or cancellations less than 24 hours before appointment time will incur a cancellation fee. Redland treatment rooms is at Redland treatment rooms.